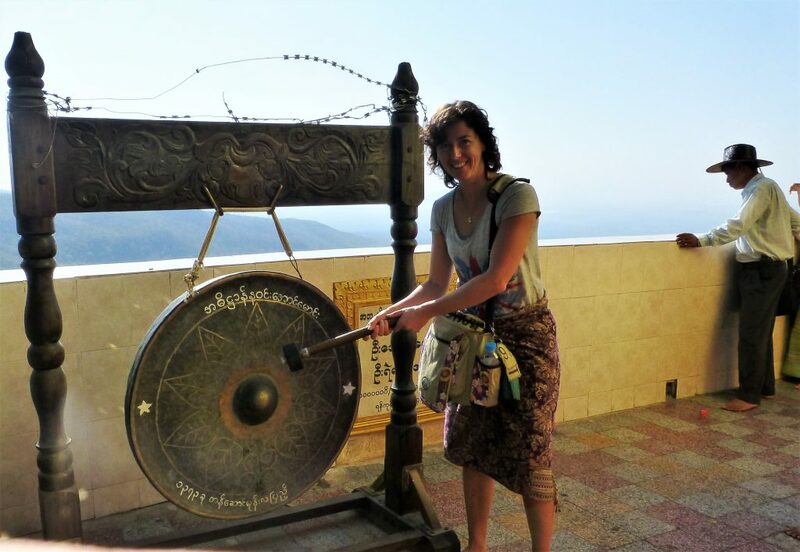 When I was in Old Bagan, Myanmar, I took a trip to Mount Popa. 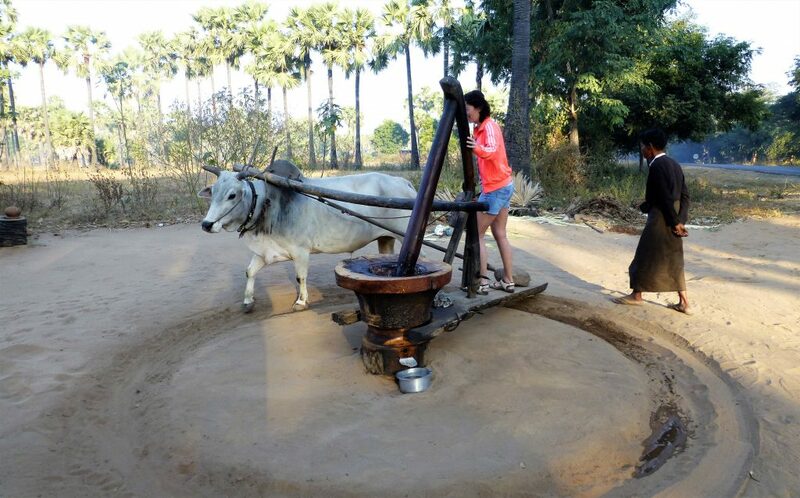 I went on this trip after biking for two days around this great and impressive area of Bagan and its temples, pagodas and stupas. This trip would bring me further around this great and wonderful area! I wouldn’t get that far by only using the bike. And boy, I loved to use the bike in the days before!! I have cycled for hours….being amazed by all those wonderful stupas, temples and pagodes!! 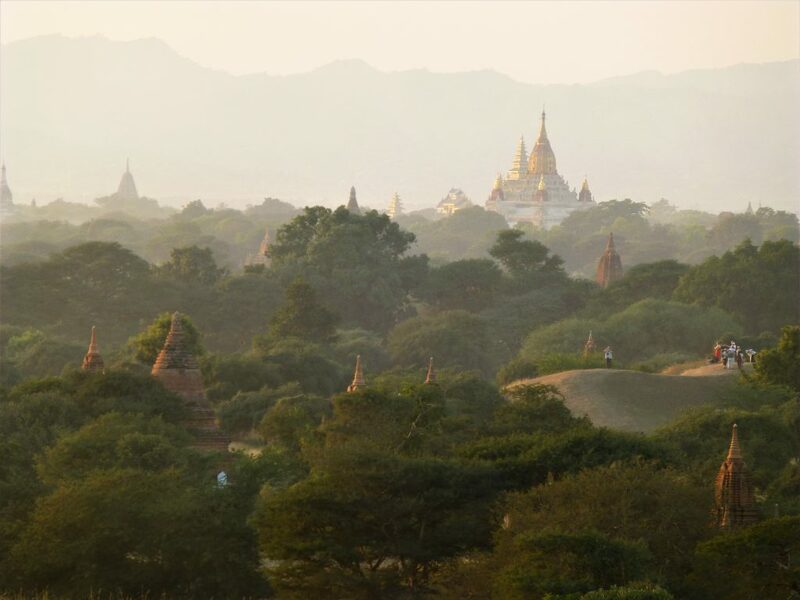 But the area of Bagan covers 40 square miles with 4000 temples, pagodas and stupas and I wanted to see more!! The Bulgarian man bought some peanuts, great way to support the local people. After an hour or so driving through the beautiful landscape we came at a viewingpoint. 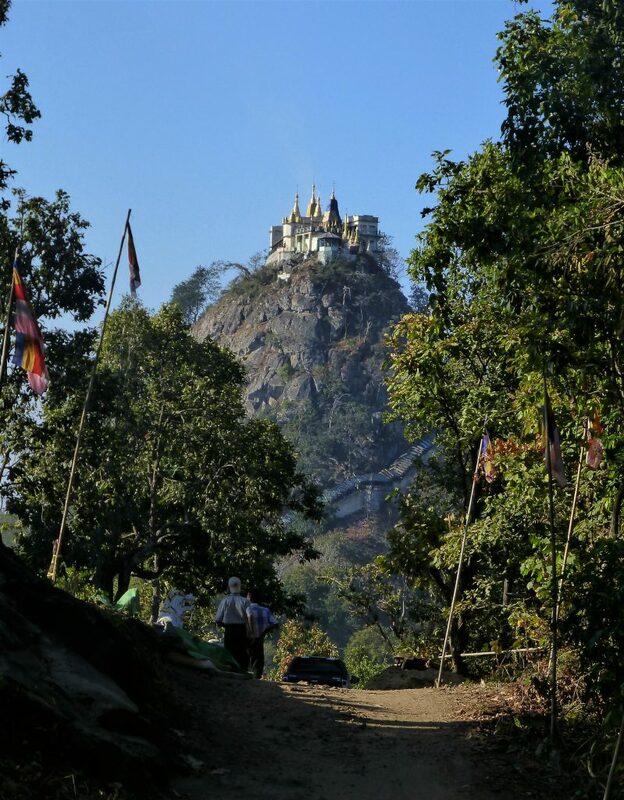 From there we could see the whole mount Popa and get some nice pictures. I was glad to get some pictures as always so I walked up this path to get the best view at the end. There was a temple which was playing music and there I heard chanting of prayers of monks. But first I wanted to get that picture…and while I was looking at…well really at both, I misstepped and fell. It was so strange. I held my camera in my hand and it was like, falling in slow motion. I remember looking back at where I came from. The Bulgarian man was walking up the street and looking at me. I was looking where to place my knee while coming down and holding my camera high! Didn’t want to fall and certainly didn’t want my camera to hit the ground. And that worked…I fell down on one knee and one elbow…. And I really fell slowly and didn’t really hurt that much. Just a small scratch. When the Bulgarian man came up to me he said he thought that I was planning to go sit/lay on the ground to get the best picture!! That is how slow I fell…it was so strange!! But I did get a great picture of the whole mountain with the temple on top!! Climbing the 700 steps to get there!! 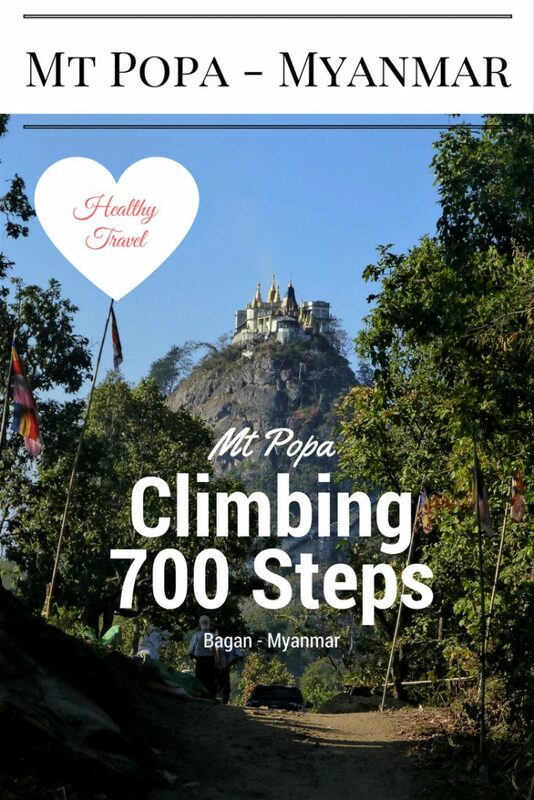 When we came in the village where mount Popa was situated. We were dropped in the middle of a street. It looked like a shoppingstreet of a normal small village. Because of all the shops and buildings I didn’t even see the mount anymore. 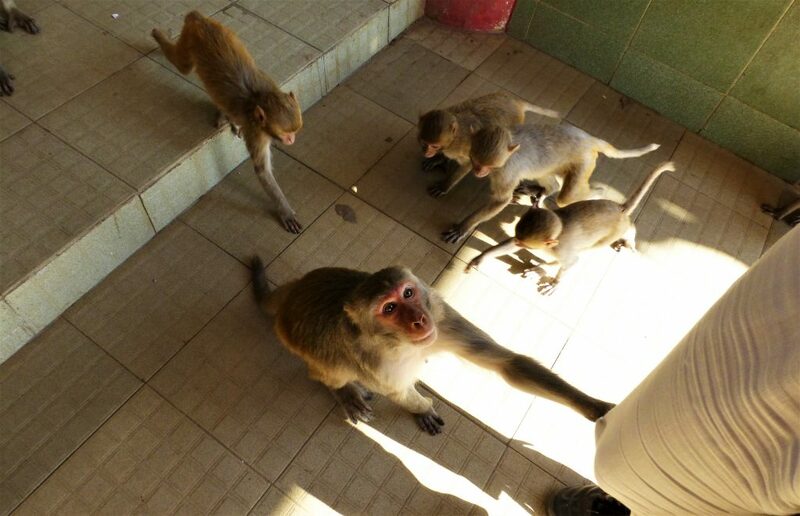 In that street we saw monkeys, they were all hassling for food at all the tourists that were visiting. The Bulgarian man still had the peanuts he bought earlier this morning. He started giving them to the monkeys. Well, when he started that they loved him very much ofcourse. I like to see it but wouldn’t hand them myself. I know that some monkeys will get a bit nasty sometimes. But again I did get some nice pictures because of the monkeys getting so close at him. I saw many other tourists walking up a stairs in between shops. We were pointed to it too. 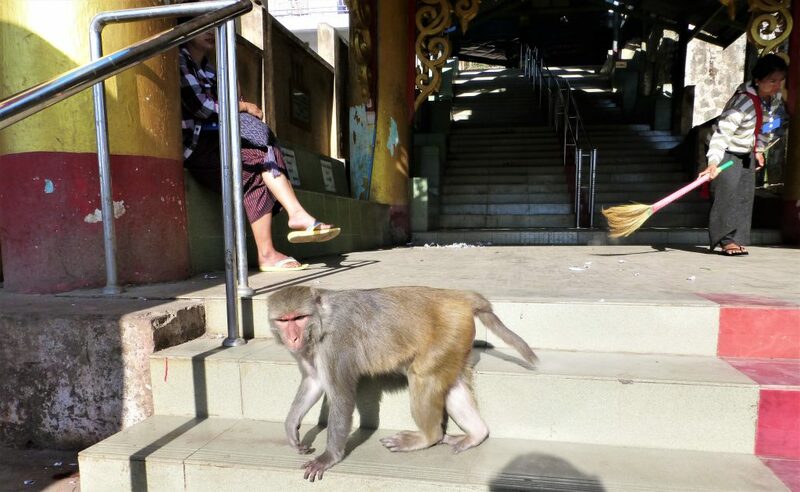 It were the stairs we had to use to go up Mount Popa. We started to walk, climbing the stairs. They were getting cleaned constantly but there was also a lot of monkey poop on it. There were so much monkeys walking there. They were getting really close to my company, he started to get a little bit scared of them. 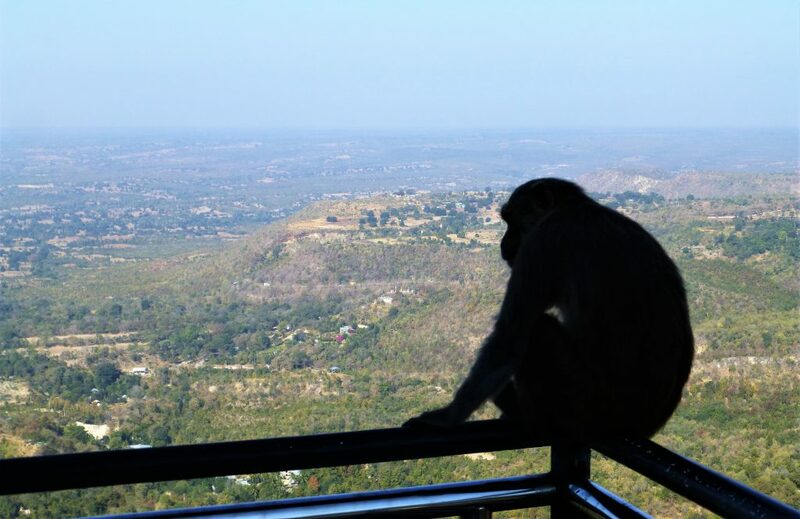 They wanted to grab some peanuts out of his hands…and at some point he threw his last peanuts to the monkeys. Well, still they thought he had some and were bothering him for it. After a while it was getting less and we had to get off our flipflops and put on a skirt to enter the top of the mountain. We walked on and got higher and higher. It was really higher then expected. I saw at some point that it was a 700 steps stairs. That is quite a climb and after a while we were starting to feel our legs. The monkeys left us after we were at about 500 stairs, I think. At that point it was also getting really hot. It was around 10.30 am and we were almost at the highest point. The temple wasn’t what I expected. It is not a Buddhist temple, the religion here was Nat Worship. 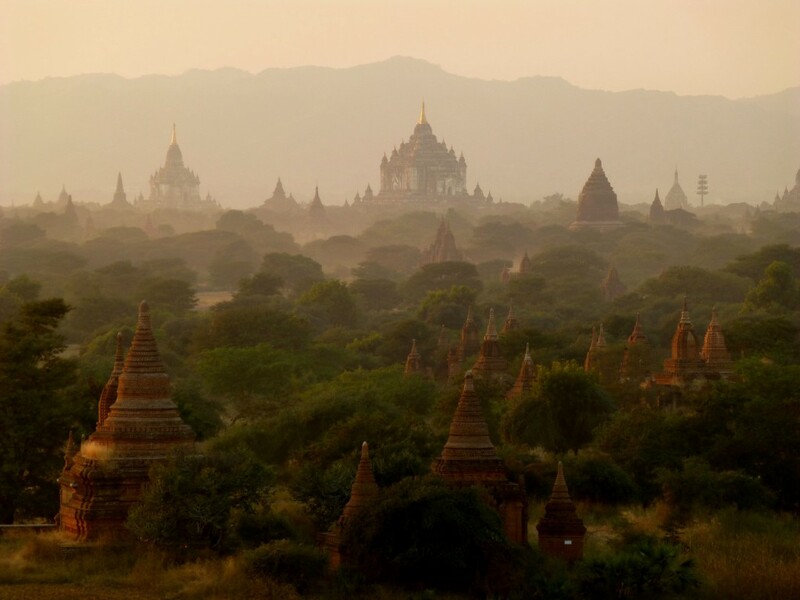 It is the oldest religion in Myanmar and it has become a part of Buddhism. It has never disappeared out of the hearts of the Burmese people. Originally it is animistic. The Burmese Nat has now evolved into spirit worship, mostly humans that have met a violent death. They are also called Nat Sein, meaning Green or Raw Spirits. The spirit, natural or human, holds dominion over a place, person or field of experience. Most Buddhist temples have a little house attached to it, to house the Nat Spirit. We walked around for a while and really enjoyed the panoramic view we had!!! This post was originally published in the online magazine of Travel Chronicles, in august 2014. If you liked this place please share it with others!! Are you also curious about some other adventures I had? Do You Know the Rules about Smoking Weed in Holland? Or would you like to go to India? Hope you like the World as much as I do! !